An analysis of the official fatality records to determine the number of Ulstermen and men from the Ulster Division who died during the Battle of Albert, which lasted from 1st July to 13th July 1916, by History Hub Ulster researcher Nigel Henderson. Over the period of the Battle of Albert, 2129 men who were born or lived in Ulster died. Over the period of the Battle of Albert the Ulster Division lost 2051 men. 1721 men who were born in Ulster died on 1st July 1916. 1517 of these men were from the Ulster Division and the remainder were from 14 other British Divisions. On 1st July 1916, 1778 men died whilst serving with the Ulster Division. The Ulster Division lost 1935 men during the two days that it was in the frontline. Anyone born in the nine counties of Ulster has been defined as being an Ulsterman and has been classified by County of Birth (with Belfast being treated as a County). Anyone born outside Ulster but had a residential association with Ulster, has been classified as “Ulster – Residence”. In determining the analysis, it was borne in mind that Ulstermen served with units attached to British Divisions other than the Ulster Division and that not all men who served in the Ulster Division were Ulstermen by birth or residence. Although the dataset is based on the CWGC fatalities, the inclusion of additional information from other primary sources enhances this record of fatalities and facilitates the analysis of the data by a range of different criteria. For example, the records of Ulstermen fatalities can be broken down into regiments or divisions as well as by county and, for Ulster Division fatalities, the non-Ulstermen can be easily identified. Whilst it cannot be claimed that this fatality list is 100% accurate or complete, it does represent a verifiable list of the men that died in that battle and is more accurate than many of the figures that have appeared in newspapers in recent months. Over the period of the Battle of Albert, 2129 men who were born or lived in Ulster died and the Ulster Division lost 2051 men. 1517 of these men were from the Ulster Division and the remainder were from 20 other British Divisions. A search of the Commonwealth War Graves Commission (CWGC) database was executed using the following criteria: The records returned were downloaded and imported to Excel and columns were added to facilitate the recording of additional information, such as Division, Type of Death, Place of Birth and associated County/Country. The spreadsheet was filtered by Regiment and Units to identify and mark those fatalities associated with units belonging to the 36th (Ulster) Division. If there was no unit reference on the CWGC database records, the unit reference was identified from other primary sources (for example, Soldier Died in the Great War, medal rolls). The “additional information” section in the CWGC data was analysed to identify counties, towns, etc. within Ulster and the relevant records were marked to indicate Ulster connection. For men identified in Step 3 as having an Ulster connection, the regiments/units were examined to identify whether they had played a role in the Battle of Albert and, where appropriate, the Division number was recorded. Note: the Long Long Trail website was used to determine the Division associated with a Regiment/Unit and whether that Division participated in the Battle of Albert. 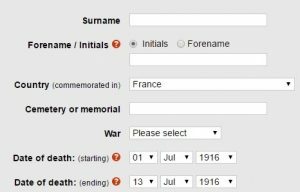 The Soldiers Died in the Great War (SDGW) online database was interrogated to identify fatalities in July 1916 in France where the birth location held on SDGW satisfied a number of Ulster-based criteria: Birth Location set to “Northern Ireland”, “Ulster”, specific cities (i.e. Belfast, Londonderry, Armagh) and each of the nine counties in turn. The results were used to update the master spreadsheet with Birth Location, County/Country of Origin, Type of Death and additional information (e.g. former regiment details, mainly for Machine Gun Corps fatalities). Where there was a Death Date discrepancy between SDGW and CWGC, other sources were checked to determine the most commonly held date – the details/sources of discrepancies were noted. Variations on Surname/Forename spellings and Regimental Numbers were also noted. For fatalities where no next-of-kin information was held on CWGC, the National Archives of Ireland Soldiers’ Wills (SW) online database was searched to identify, where a will is present, the next-of-kin name, relationship and address. The Register of Soldiers’ Effects (RSE) and Ireland Census returns were also searched to identify the name(s) and relationship(s) of the beneficiaries and the addresses of widows/parents. In checking the Register of Soldiers’ Effects, priority was given to cases where there was no Birth Location recorded on the SDGW database – there are over 950 fatality records where a next-of-kin has not yet been identified. The In Memoriam notices placed in the Belfast Evening Telegraph in late June and early July 1917 were trawled to identify next of kin details. The family memorials in the War Graves Ulster archive that specified deaths during the period of the Battle of Albert were examined to identify next of kin details. Whilst it cannot be claimed that this fatality list is 100% accurate or complete, it does represent a verifiable list of the men that died in that battle and is more accurate than many of the figures that have appeared in newspapers in recent months. We would welcome suggestions of names that are not present in the attached spreadsheet. Click here to email. This entry was posted in News and tagged 36th Ulster Division, Battle of the Somme, battles of the somme, Belfast Somme 100, Somme 100, the somme, ulster, ulster division, ulstermen on the somme. Bookmark the permalink.